It’s notoriously difficult to get work as a young RN straight out of nursing school. In order to put in their dues and get the experience they need to get better jobs, many nurses have to take less than ideal jobs at facilities they’d rather not work at. 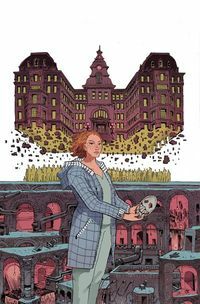 However, that isn’t the case in Cullen Bunn’s new horror story, The Unsound #1. Ashli takes a job at Saint Cascia because she’s young and naïve enough to believe she can make a difference in a broken system. Saint Cascia was founded in 1816 and ran continuously as an asylum until it was closed in the ‘80s due to lack of funding. It was recently reopened and suffers from a lack of funding, improper staffing ratios, and overpopulation. The situation is creepy enough at face value, and we quickly learn there is more going on here than meets the eye. 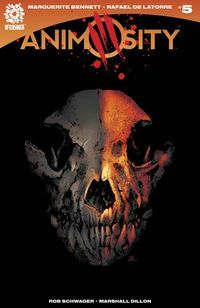 Looking at Cullen Bunn’s body of work, you can make a solid argument that horror is his genre. 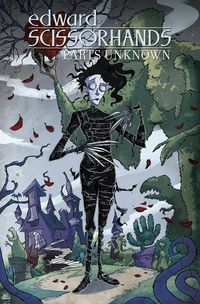 Readers of Harrow County, The Sixth Gun, Regression, and The Damned will definitely want to follow Bunn down this new rabbit hole. PICK UP UNSOUND #1 FROM TFAW TODAY! 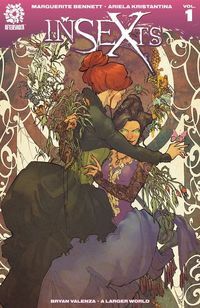 Marguerite Bennett is a comic writer that has demonstrated the ability to touch on many themes, tones and styles. Born in Virginia, she is a self-described Nerdy Southern Belle. 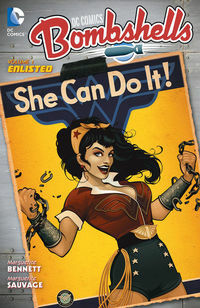 In DC Comics Bombshells, she re-imagines prominent female characters in the context of ‘40s WWII culture. Her work Insexts subverts historical expectations and Victorian literature for an twist. She is currently a writer for DC Comics, Marvel, Aftershock, BOOM! Studios, Rosy Press, and more. 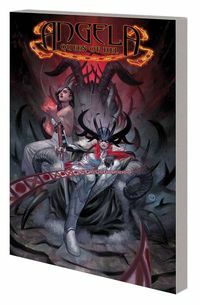 In 2016, she was nominated for a GLAAD Media Award for Outstanding Comic Book for Angela: Queen of Hel. 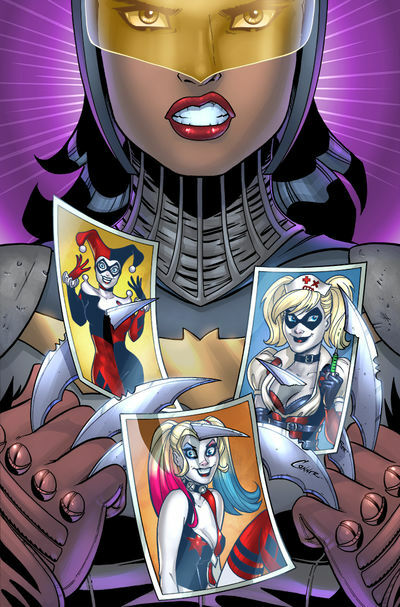 This year she’s nominated for her work on DC’s Bombshells. 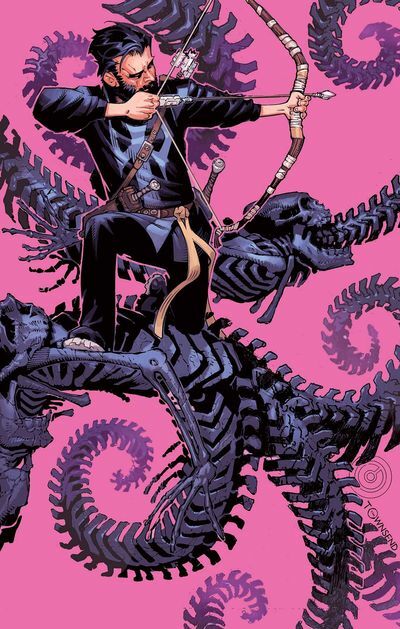 Comics are often about building new worlds. These fictional societies have their own sets of rules and order. And they don’t always have to be fantastical. Sometimes they’re a slice of a world that’s under-exposed. Such is the case in Matt Kindt and Tyler Jenkins new comic Grass Kings. In Grass Kings #1 we are introduced to the Grass Kingdom, a small patch of land that does not recognize the authority or rules of the United States. Grass Kingdom has a longstanding feud with neighboring town Cargill. The citizens of Grass Kingdom are viewed as squatters illegally possessing the land. The central conflict of the book revolves around Cargill’s sheriff and the two brothers who run Grass Kingdom. Bruce and Robert inherited the kingdom from their family who’s possessed the land since World War I. Robert is the king and Bruce is the sheriff in charge of protecting the land from Cargill. The relationship between Robert and Bruce is a tenuous one at best. Robert lost his daughter and has fallen into alcoholism to deal with his grief. This puts pressure on Bruce to look out for the well being of the town and his brother. Kindt’s script generates a lot of conflict right from the start. This is a book with a great deal of narrative setup at work. It’s a family drama and a crime story. But it’s also a mystery. Kindt’s writing pairs extremely well with Jenkin’s exceptional artwork. The hazy water colored images strike a beautiful balance between detailed and dreamlike. This is especially true as the book shifts into flashback scenes. 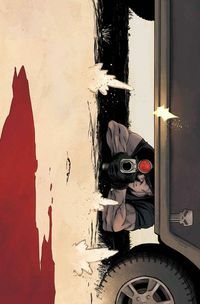 Overall, this a strong first issue that does a great job of establishing setting and characters. It also leaves enough threads for readers to continue to pick up future issues. 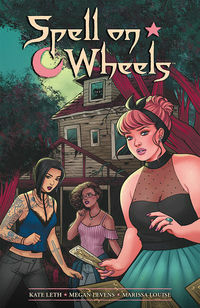 Writer and artist Kate Leth is widely-recognized as one of the top talents helping to shape a new generation of comics. 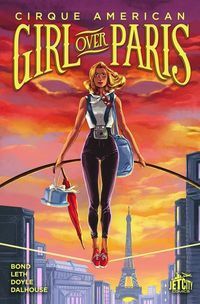 Canadian-born Leth, who now lives in Los Angeles, gained notoriety for her work focusing on teen and all-age stories – for comics and graphic novels, as well at the screen. Leth attended Nova Scotia College of Art and Design (NSCAD University) studying photography before dropping out. Afterwards she started working at the Strange Adventures comic shop in Halifax, Nova Scotia, That’s where her interest in comics grew. She caught the attention of BOOM! Studios with her Adventure Time fan art on her Tumblr page. 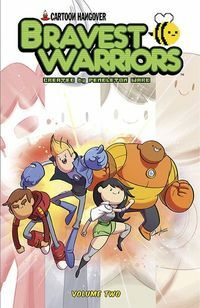 And that subsequently turned into graphic novel, Adventure Time: Seeing Red, which hit The New York Times Best Seller list. 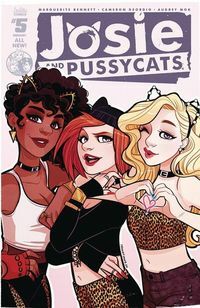 She is also collaborator on the podcast Less than Live with Kate or Die, and is the organizer of The Valkyries, a group of women who work in comics retail. 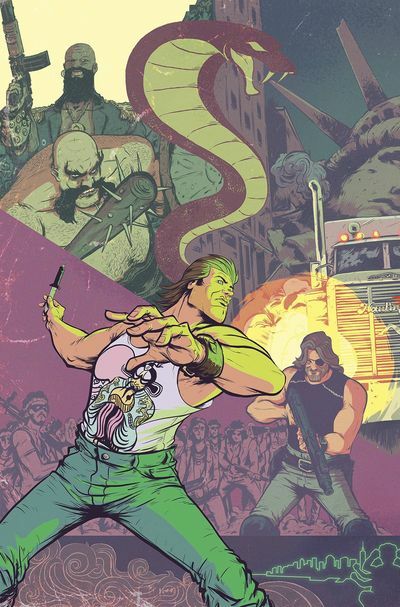 The first issue of this six-part series is brisk and action packed. And it delivers all you could hope for in a Justice League–Power Rangers crossover. 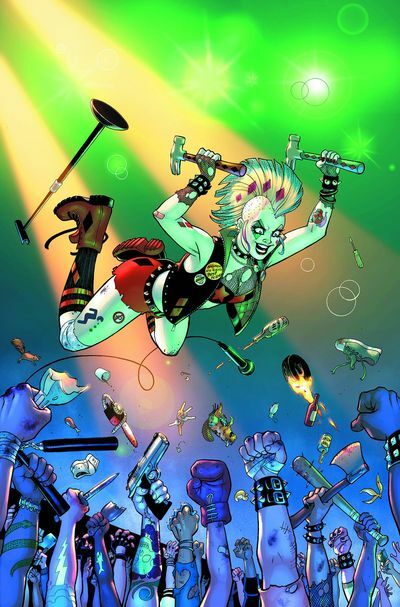 The result is plenty of action and spectacular appearances of your favorite comics characters. 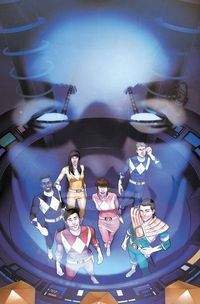 Justice League Power Rangers #1 begins in the Power Ranger’s home and metropolis of Angel Grove. We are dropped in the action moments after a cataclysmic catastrophe has wiped Angel Grove off the face of the planet. There is a time swipe and we are brought back 36 hours where the Power Rangers are grouping up to find Alpha 5. Zack finds him and brings him back, but it’s all a trap. Lord Zedd and his Putties invade the Command Center. A fight breaks out and Zack ends up teleporting Zedd away. Unfortunately he teleports them to another world. It is here on the earth in the DC Universe that Batman is mistaken for one of Zedd’s cronies. A spectacular fight breaks out between the Rangers and our Caped Crusader of Gotham. A major part of the story has already been set up with the destruction of Angel Grove. In future issues you can expect many unique team ups and meaningful moments between the two groups of heroes. Already we have the sense that Zack is going to feel guilty for all that has happened. He’ll need someone to ground him (into the earth, not confine him to his room) and what better mentors of power than the Justice League? There is a lot to look forward to in this mini-series. So, if you grew up with either or both of these series, you’ll love this crossover. 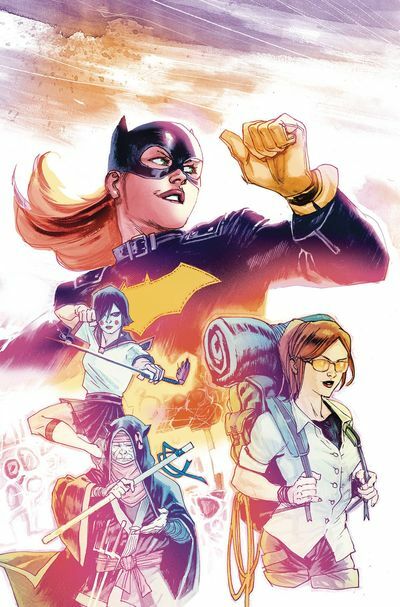 With SDCC behind us, it’s back to buiness – and this week for New Comic Book Day we give you a glimpse at Batgirl, Adventure Time Comics, and X-Men ’92! Remember theses are only a few of this week’s new releases that stood out from the crowd. Check out our other blog articles so see our thoughts on other books. Be sure to like, comment and share our post on Facebook or Twitter if you like our articles! Batgirl has left Burnside. 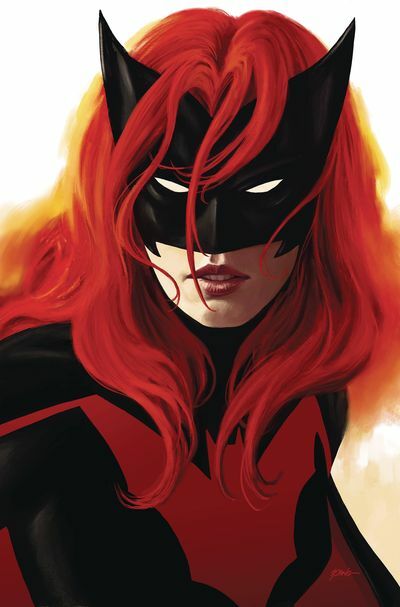 Since Barbara Gordon returned to her post-Oracle role as Batgirl, she was forced to revisit her past a number of times. 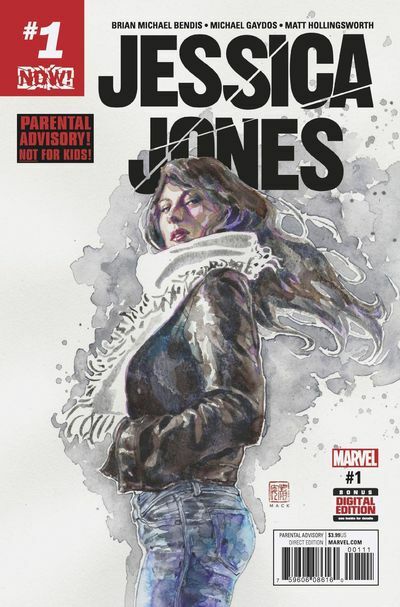 She has ventured beyond Gotham City, and will have to put the pieces of that past behind her in order to look forward. 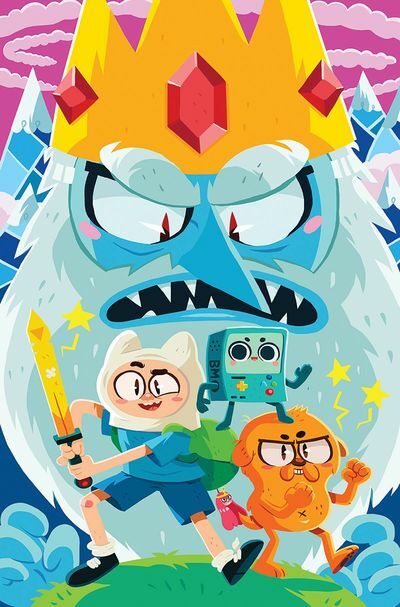 This series is definitely for those who are big Adventure Time fans! 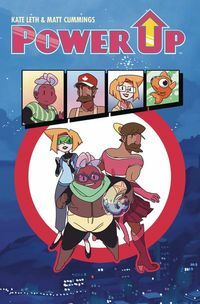 It’s a collection of short stories written and illustrated by some well-known names such as Art Baltazar (Itty Bitty Hellboy, Aw Yeah Titans), Katie Cook (My Little Pony: Friendship is Magic) Kat Leyh (Co-writer and cover artist for Lumberjanes) and Tony Millionaire (Sock Monkey). With Scott leaving the X-Men in the last issue of X-Men ’92, he and Jean reside in Scott’s hometown of Anchorage, Alaska. 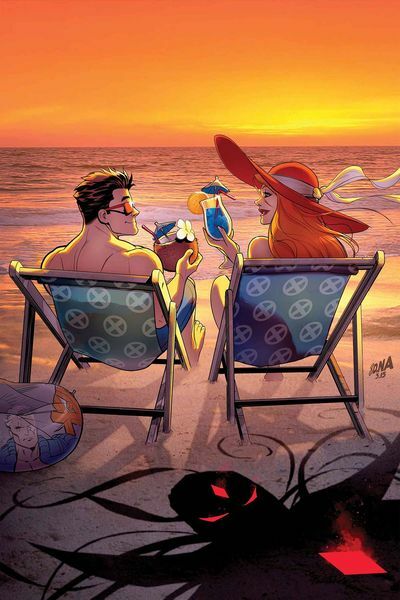 While they have a joyous vacation away from all the chaos that is the X-Men, their daughter from the future, Rachel Summers, has used the Phoenix to bring them to the year 3992. In hopes of defeating Apocalypse and Mr. Sinister once again. What I really enjoyed about this issue was that it re-told “The Adventures of Cyclops and Phoenix” story from 1994. X-Men ’92 is always fun to read, especially growing up with the cartoon. Chris Sims’ writing is on par with the original series, utilizing everything that made that cartoon great. For New Comic Book Day this week – we look at an Old Man, a New Super Man, a Giant Gorilla, and celebrate Star Trek’s 50 years. As always these are only a few of this week’s new releases that stood out from the crowd. Be sure to comment or share our post on Facebook or Twitter if you like our articles! In the last issue of Old Man Logan, we saw Logan defending the people of Killhorn Falls from a crazed group of killers called the Reavers lead by Lady Deathstrike. He will stop at nothing to keep this group from killing the woman who became his wife from his lost timeline. With his back against the wall, Logan succeeds in pushing the threat away from the population and leaves to keep them safe. 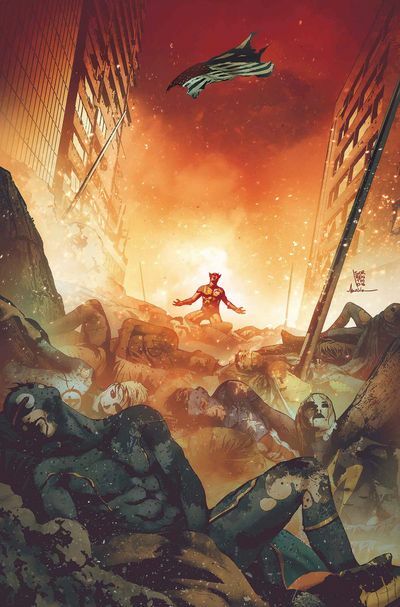 In this much-anticipated issue, we find Logan not too far in the future from the events of the last story arc, living once again with his team and family, the X-Men, with one exception – Jean Grey is alive and wants nothing more than to help out her lifelong friend. We also get to see, through Logan’s memories, the events that lead to the night the heroes fell. We now know what happened at the Xavier School for the Gifted – when the villains used Logan as their killing machine to take down the X-Men (see Old Man Logan by Millar and McNiven) – but we never got to see the fall of New York, or what led to the descent of Hank Pym. By the end of this issue, all will be revealed. 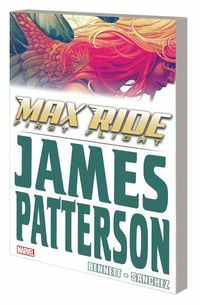 And in the conclusion of this amazing book, we get to see a perfect reunion that will hit home with any Wolverine fan – or any comic fan in general. Shanghai, China. Kong Kenan is a bully that justifies his behavior by picking on Lixin, whose father runs an airline. The very same airline who he holds responsible for the death of his mother. Kenan’s father is a mechanic that is part of a “Writers’ Group” which are conspiracy theorists attempting to prove the existence of the Ministry of Self-Reliance. These pieces converge when the villain Blue Condor swoops in to abduct Lixin. Kenan instinctively throws a can of soda (which he stole from Lixin) at Blue Condor. This is caught on video and gains the attention of the Ministry of Self-Reliance. Who approaches him to grant him the powers of Superman. First things first, the art of this comic book is gorgeous! I was memorized by Carlos Magno’s clear and very detailed illustrations. This issue opens up to a time before Kongs became extinct. 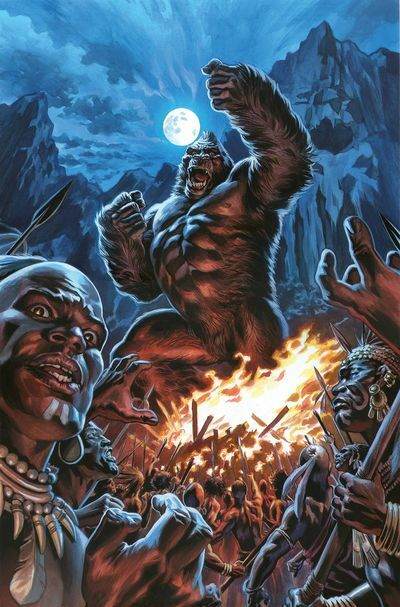 The people believed the gods protected us through the Kongs. 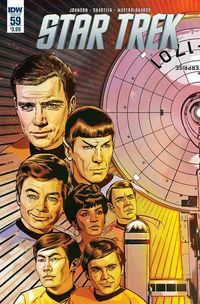 As we near the 50th anniversary of Star Trek we see the crew of the Starship Enterprise enter a place in space that seems to be a bridge to alternate realities. The crew, for a time, switches minds with their movie and original series counterparts. This comes with some comedic surprises for them. Switching back and forth between old and new crew members was cool. Mike Johnson did a good job slightly altering how each Kirk or Spock said the same line, highlighting the differences between the two universes. Since he came aboard, Tony Shasteen has done a fantastic job drawing the series. Each character is easily recognizable, even for casual viewers of the series. Batman teams up with the Avengers? 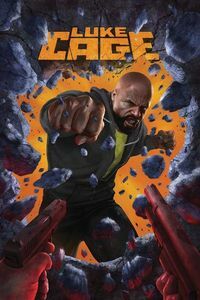 The creator of Rat Queens takes us to space, The Punisher contnues his path of destruction, and the Justice League go through a Rebirthing-all this week for New Comic Book Day. As always these are only a few of this week’s new releases that stood out from the crowd. Check out our previous blog articles to see our thoughts on other books. Be sure to comment or share our post on Facebook or Twitter if you like our articles! Sisters Nina and Georgie steal from the rich and give to the poor, and keep some for themselves. Hey, they have to eat, too. 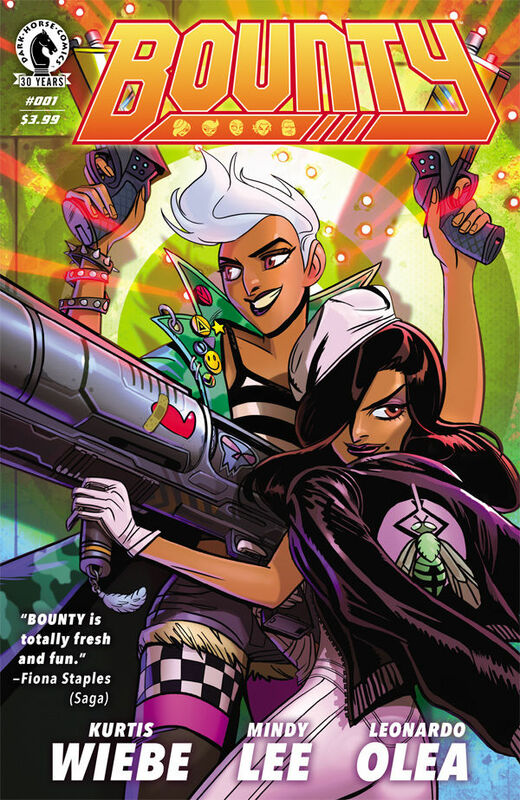 From Rat Queens creator Kurtis Wiebe and artist Mindy Lee. Comes this Robin Hood-Esq space tale. This 40-page introduction really lays out the landscape for the new series. 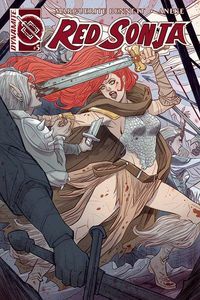 Kurtis has proven in the past he can write both funny and engaging teams with Rat Queens and this is no exception. I had a ton of fun with the sisters and their teammates. Bounty hits on elements seen in popular series like Firefly and Cowboy Bebop, but dials up the sci-fi, and futurism so that we end up with something unique, but familiar at the same time. It’s a brand new day for the Justice League! After the Superman of the New 52 sacrificed his life to protect all human life, there was a void left in the Justice League. Now as they mourn the loss of their friend, they face the task of picking up the pieces. 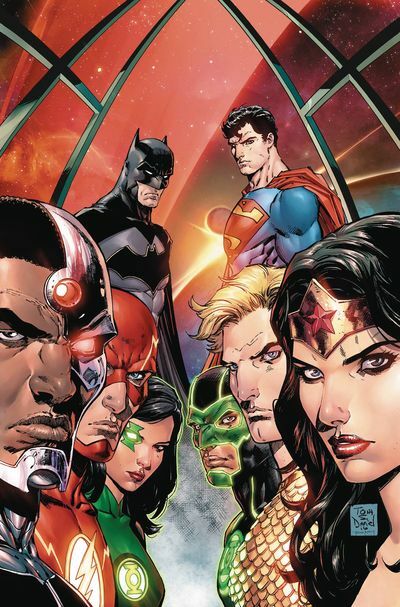 A large alien threat attacks, bringing together Batman, Wonder Woman, The Flash, Aquaman, Cyborg, and rookie Green Lanterns – Simon Baz, and Jessica Cruz. 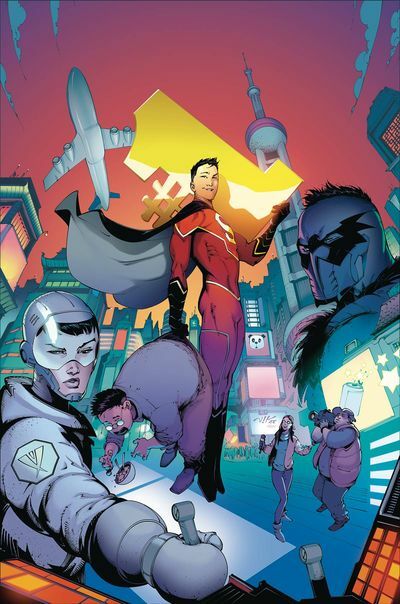 Our Pre-Flashpoint Superman has made his presence known to few, but he cannot help but see this threat and rush into action to help the heroes of this Earth by stepping into his former role. Previously in Punisher, Frank Castle goes up against Condor, a mob that’s manufacturing a drug called EMC which is making people stronger, faster, and immune to pain. While Punisher takes out all of Condor’s head men, This leaves the DEA to come after Frank. After all, he is killing all their evidence for their case. His next hit is Josiah, one of the makers of EMC. However, Josiah comes with a catch. A little girl strapped with explosives and a father who is ready to hit the detonator as soon as the Punisher shows up. Last Time on Batman 66…. Well, I don’t know what happened last time actually, but I can tell you that this is the first time we’ve EVER seen Batman team-up with the Avengers! No, not those Avengers from Marvel, the other ones from across the pond, Boom Studios’ Steed and Mrs. Peel. With the Gotham Museum hosting the White Star Diamond from the Royal Family, everything looks to be fine until Catwoman appears, and she’s on the prowl for new accessories. 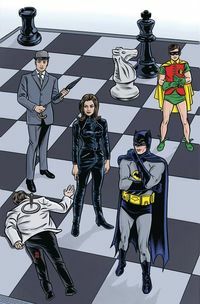 Although Batman and Robin were too late, British Secret Intelligence agents Steed and Mrs. Peel were on the case. But could it be that something more sinister is going on? Was Catwoman behind it all? Will Steed and Peel ever be called The Avengers again? Find out next time, Same bat-time, same bat-channel! If there ever was a contender for best crime book for kids, this would be on top. With a tagline of “Nancy. Harriet. Veronica. There’s a new Sleuth on the block.” I had to give it a read. 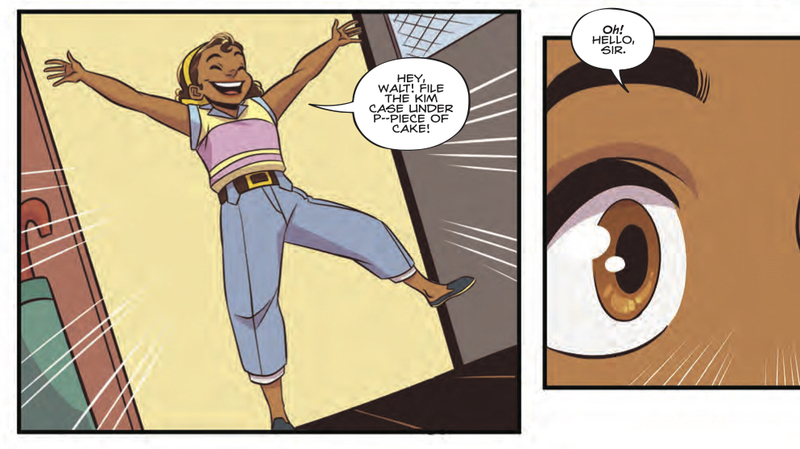 Hope Larson (A Wrinkle In time) & Brittney Williams (Patsy Walker aka Hellcat, Legend of Kora) team up for a new all-ages detective book from Boom! in the same vein as Nancy Drew and Harriet the Spy. The series focuses on Marigold “Goldie” Vance a 16-year-old who grew up at the Crossed Palms Resort, a nice resort in St. Pascal, Florida. Goldie has big aspirations beyond working the valet booth at the resort; she wants to be a Detective. She does her best to help Walter, the in house detective at Crossed Palms, although her help is not always wanted. Beyond that we have a great cast of characters, because a Sleuth is only as good as the company they keep. There’s Walter, as we spoke of before, and Cheryl LeBeaux, Goldie’s friend who also works the front desk. We also get introduced to Mr. Vance, Goldie’s father and the manager of the Crossed Palms, and Rob who helps Goldie run valet (and has a crush on Cheryl). What’s fun about this series is Goldie’s personality. She’s so eager to help and so sure of herself you can’t help but want her to solve every case. She is also pretty silly at times with how over confident she can be. Brittney Williams’ designs are fantastic. 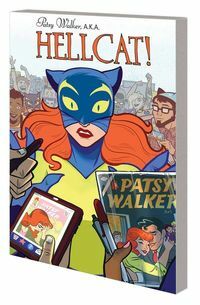 If you’ve read her and Kate Leth’s Patsy Walker aka Hellcat series, the art is very similar. That’s most certainly not a bad thing; her art is very fun and perfect for a story like this. 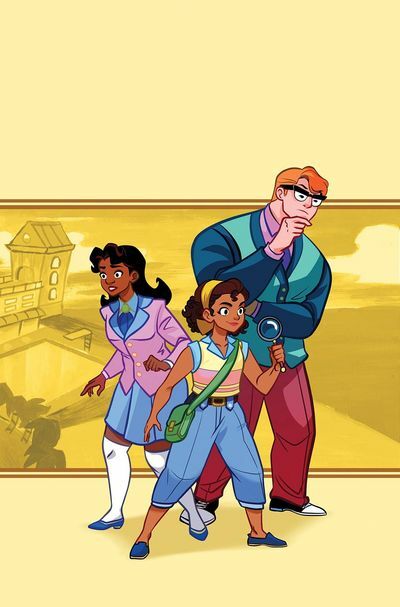 With this only being a 4-part miniseries, I can only hope that this book finds its audience so we can get more adventures with Goldie Vance and gang. 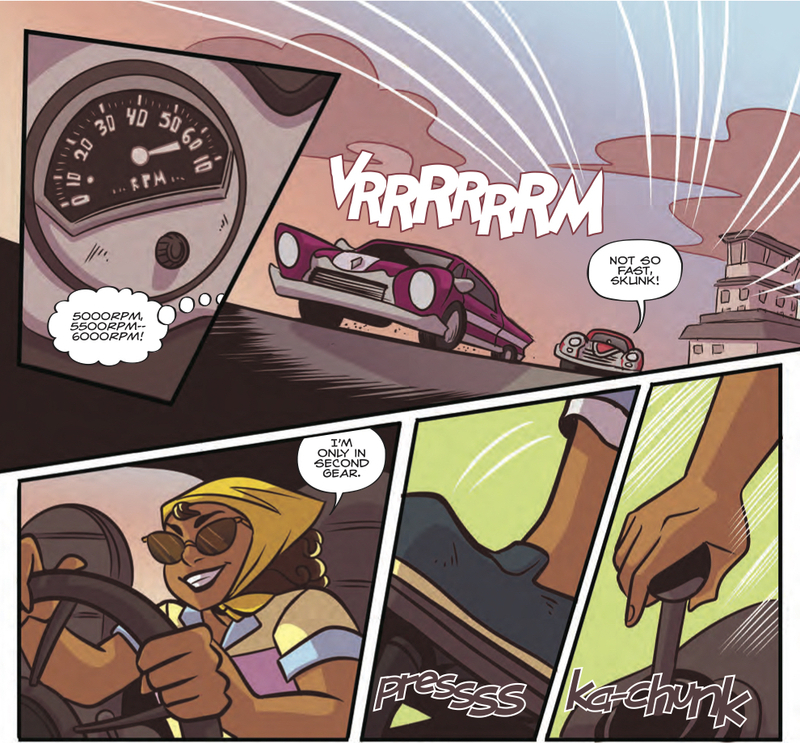 The first three Goldie Vance issues are currently available for order right now at TFAW.com! Perfect for fans of Veronica Mars, Lumberjanes, Gotham Academy, or Scooby Doo.